RD Sharma (2017) Solutions for Class 9 Math Chapter 1 Number System are provided here with simple step-by-step explanations. These solutions for Number System are extremely popular among class 9 students for Math Number System Solutions come handy for quickly completing your homework and preparing for exams. All questions and answers from the RD Sharma (2017) Book of class 9 Math Chapter 1 are provided here for you for free. You will also love the ad-free experience on Meritnation’s RD Sharma (2017) Solutions. All RD Sharma (2017) Solutions for class 9 Math are prepared by experts and are 100% accurate. Now we have to express this rational number into decimal form. So we will use long division method as below. Look at several examples of rational numbers in the form pq (q ≠0), where p and q are integers with no common factors other than 1 and having terminating decimal representations. Can you guess what property q must satisfy? Prime factorization is the process of finding which prime numbers you need to multiply together to get a certain number. So prime factorization of denominators (q) must have only the power of 2 or 5 or both. An irrational number is a real number that cannot be reduced to any ratio between an integer p and a natural number q. Explain, how irrational numbers differ from rational numbers? Every rational number must have either terminating or non-terminating but irrational number must have non- terminating and non-repeating decimal representation. A rational number is a number that can be written as simple fraction (ratio) and denominator is not equal to zero while an irrational is a number that cannot be written as a ratio. Hence is a rational number. So, we arrive at a contradiction. (vi) Let be a rational number. So is an irrational number. x2 is rational.So, x2-29 is rationalx2-29-4 = 5 is rational. (i) difference is a rational number. (ii) difference is an irrational number. (iii) sum is a rational number. (v) product is an rational number. (vi) product is an irrational number. (vii) quotient is a rational number. (viii) quotient is an irrational number. Give two rational numbers lying between 0.232332333233332... and 0.212112111211112. Here the decimal representation of a and b are non-terminating and non-repeating. So we observe that in first decimal place of a and b have the same digit but digit in the second place of their decimal representation are distinct. And the number a has 3 and b has 1. So a > b. Here the decimal representation of a and b are non-terminating and non-repeating. So we observe that in first decimal place a and b have the same digit but digit in the second place of their decimal representation are distinct. And the number a has 1 and b has 3. So a < b. Find one irrational number between 0.2101 and 0.222... = 0.2¯. Here a and b are rational numbers .Since a has terminating and b has repeating decimal. We observe that in second decimal place a has 1 and b has 2. So a < b. Here decimal representation of a and b are non-terminating and non-repeating. So a and b are irrational numbers. We observe that in first two decimal place of a and b have the same digit but digit in the third place of their decimal representation is distinct. Here a and b are rational number. 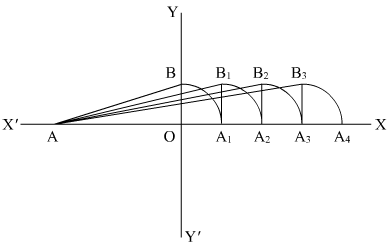 So we observe that in first decimal place a and b have same digit .So a < b. Hence two irrational numbers are and lying between 0.5 and 0.55. Here a and b are rational number. So we observe that in first decimal place a and b have same digit. So a < b. Hence two irrational numbers are and lying between 0.1 and 0.12. Prove that 3+5 is an irrational number. Thus we arrive at contradiction that is a rational which is wrong. Find three different irrational numbers between the rational numbers 57 and 911. Hence are required irrational numbers. (iv) Every real number is either ... number or ... number. (i) Every point on the number line corresponds to a real number which may be either rational or an irrational number. (ii) The decimal form of an irrational number is neither terminating nor repeating. (iii) The decimal representation of rational number is either terminating, recurring. (iv) Every real number is either rational number or an irrational number because rational or an irrational number is a family of real number. Represent 6, 7, 8 on the number line. 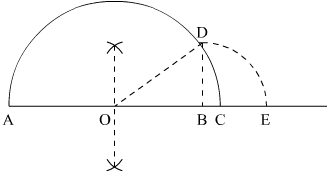 (5) Take A as center and AB1 as radius and draw an arc which cuts the line AX at A2. Represent 3.5, 9.4, 10.5 on the real number line. Find whether the following statement are true or false. (i) Every real number is either rational or irrational. (ii) π is an irrational number. (iii) Irrational numbers cannot be represented by points on the number line. (i) True, because rational or an irrational number is a family of real number. So every real number is either rational or an irrational number. (ii) True, because the decimal representation of an irrational is always non-terminating or non-repeating. So is an irrational number. (iii) False, because we can represent irrational numbers by points on the number line. 1. Which one of the following is a correct statement? The decimal expansion of an irrational number is non-terminating and non- repeating. Thus, we can say that a number, whose decimal expansion is non-terminating and non- repeating, called irrational number. And the decimal expansion of rational number is either terminating or repeating. Thus, we can say that a number, whose decimal expansion is either terminating or repeating, is called a rational number. Hence the correct option is . Which of the following is a correct statement? The sum of irrational number and rational number is always irrational number. Let a be a rational number and b be an irrational number. As 2ab is irrational therefore is irrational. Which of the following is irrational? And 7 is not a perfect square. Here is non-terminating or non-repeating. So it is an irrational number. Which of the following is rational? The term “natural number” refers either to a member of the set of positive integer . And natural number starts from one of counting digit .Thus, if n is a natural number then sometimes n is a perfect square and sometimes it is not. Which of the following numbers can be represented as non-terminating, repeating decimals? Here is repeating but non-terminating. In basic mathematics, number line is a picture of straight line on which every point is assumed to correspond to real number. Hence the correct answer is . Here the number is non terminating or non-repeating. The correct option is . Is zero a rational number? Can you write it in the form pq, where p and q are integers and q ≠ 0? Yes, zero is a rational number because it is either terminating or non-terminating so we can write in the form of , where p and q are natural numbers and q is not equal to zero. Find five rational numbers between 1 and 2. We need to find 5 rational numbers between 1 and 2. So, five rational numbers between 66 and 126 will be 76, 86, 96, 106, 116. Hence 5 rational numbers between 1 and 2 are: OR . Find six rational numbers between 3 and 4. We need to find 6 rational numbers between 3 and 4. So, six rational numbers between 217 and 287 will be . Hence 6 rational numbers between 3 and 4 are . Find five rational numbers between 35 and 45. We need to find 5 rational numbers between and . Are the following statements true or false? Give reasons for your answer. (i) Every whole number is a natural number. (ii) Every integer is a rational number. (iii) Every rational number is an integer. (iv) Every natural number is a whole number. (v) Every integer is a whole number. (vi) Every rational number is a whole number. (iii) False, rational numbers are represented in the form of fractions. Integers can be represented in the form of fractions but all fractions are not integers. for example: 34 is a rational number but not an integer. (v) False, because set of whole numbers contains only zero and set of positive integers, whereas set of integers is the collection of zero and all positive and negative integers. (vi) False, because rational numbers include fractions but set of whole number does not include fractions.